I just searched for #food on Instagram and received 27189059 photos back! In my broader work, I have seen tagged instagrams of food people are about to eat at restaurants. 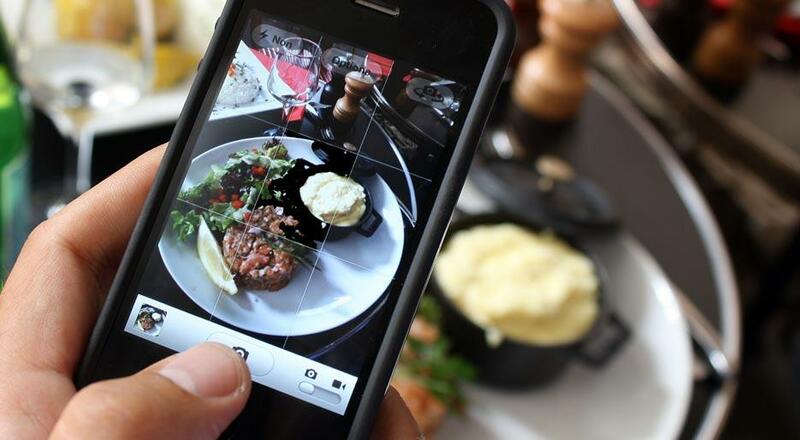 The posting of one’s plate became popular on Flickr and Facebook, but has seen a dramatic increase on Instagram. Not only have filters been key to crafting a particular visual aesthetic, but Instagramming bizarre, shocking, and beautifully presented food has become increasingly popular. In my book, I discuss a notion of ‘update cultures’, where we have seen an increasing social trend of updating the world about our lives. This can be seen when people travel and post to Facebook during their trip about their experiences. Additionally, they may be more likely to Instagram their restaurant experiences while traveling. I have been doing work on instagram use during Superstorm sandy and have found that instagrams of food and pets had a humanizing effect during the disaster. In the world of restaurants, UrbanSpoon, TripAdvisor, and other sites have been seen as important social media to bringing customers to restaurants. Because Instagram uses hashtags, it is able to leverage patterns of ‘electronic word-of-mouth’ (eWOM) similar to Twitter. Scholarship on social media has shown that eWOM recommendations from one’s social media network carry much more weight than anonymous reviews. This extends to Likes and Check-Ins too. This has been something tested broadly in marketing scholarship under the notion of ‘earned’ rather than ‘bought’ advertising. One tweet or Instagram promoting a particular restaurant has a powerful effect on consumption, which sociologists should pay attention to!